If I’m a high school recruit looking to play in college, here are four things I would want in a college coach: 1. I want someone that will shoot me straight. 2. I want a coach that’s more committed to his/her program than anyone else on the planet. 3. I want a coach that will help me become the best I can be. 4. I want coach that cares more about the process, than the wins and losses. If you’re a high school recruit wanting the same things out of your college coach, you’ve got the right idea. 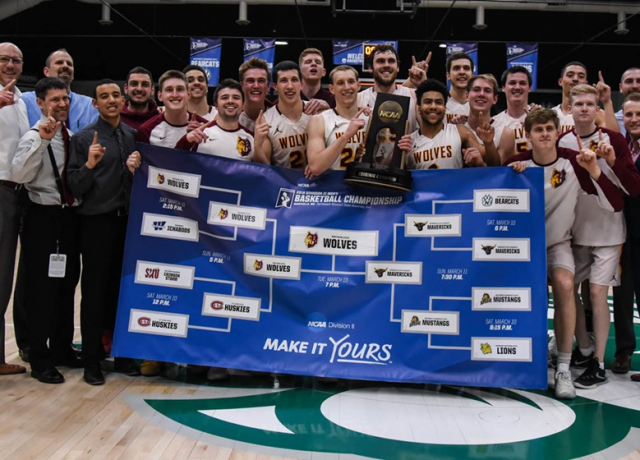 More specifically, if you’re a high school basketball recruit wanting those qualities in your college coach, I’d like to introduce you to Northern State University’s Paul Sather! This week, I was able to sit down and talk recruiting with one of the best coaches in all of college basketball. From making the right college decision, to his advice on using social media, here is what Coach Sather had to say. Q: How can a recruit be confident in making a college decision? A: As a student-athlete, you’ve got to expect that life isn’t always going to be perfect. No matter what level you play at or which college you choose, you’re going to experience some adversity. With that in mind, we typically recruit guys within our own region and we do that for two reasons: 1. they more naturally “buy-in” to our program and 2. when those tough times do hit, their environment is still very similar to home. To the first point, we want guys that want to play basketball for Northern, are familiar with our tradition and are willing to do what it takes, here. And to the second point, this is Aberdeen, South Dakota! We don’t have a large population and it can become a lot colder once that adversity hits! We want guys that understand what living in the upper Midwest is all about. So, to be confident that you’re making the right decision, my advice is to go somewhere you can totally buy-in and where you’re willing to stick it out when times do get tough. Q: Give me some insight into the differences between the various levels of college basketball. A: Realistically, if you have what it takes to get to the Division I level, you’re going to get there. With how easy it is to share video and get exposure in 2018, there aren’t many guys going unnoticed anymore. If you do get to that level, that’s great! But, don’t get so hung up on the level you’re going to play. Because all you’re doing is limiting your options and ultimately, that’s not what’s going to make you happy, anyway. What is going to make you happy is getting the opportunity to play and who you’re playing with. Winning is a lot of fun, too! I don’t care what level it is, if you have a chance to play for championships with a group of guys you enjoy playing with, you’re going to love the experience. So, keep your options open. Because your happiness has nothing to do with Division I, Division II or any other level. Q: What advice do you have for student-athletes regarding social media? A: Simplify. If you can’t do it right, don’t bother with it! Every program that you want to play for is going to pay attention to what you’re posting, especially if you’re one of the top five or ten guys they’re recruiting. Coaches want to know who you are, and they’ll go to tremendous lengths to confirm what they think or uncover what they don’t know. As much as we look for body language, how you treat your coaches and teammates, we’re equally paying as much attention to the social media stuff. And, it’s easy to see what’s really going on in your mind, just by how you use social media. It really is a magnifying glass. Q: What advice do you have for parents of recruits? A: There’s a fine line between supporting your child and doing too much. I look back at my parents and then the parents of some of the best kids I’ve coached, and I’ve learned what genuine support is all about. As a parent, you’ve got to let your kid fail. Let them learn by getting through the ups and downs that come with playing sports. Unfortunately, we see a lot of parents that try to make everything perfect for their children. They try to remove all the barriers or obstacles that life is going put in front of their kids. And, what ends up happening to those kids is that they don’t learn how to handle adversity. They’ll quit or move on to something that’s a safer bet. I just don’t think that’s healthy or productive, at all. Listen, I’m a dad, too! I just think sometimes we need to get out of the way and let them struggle. Let them fail. Now, be there to pick them up and love them. But, don’t be there to fix it for them and make everything perfect for them.